I’m tempted to just tell all of you that this book by Octavia Butler is even better than Margaret Atwood’s The Handmaid’s Tale and that you must read it and leave it at that. But I’m pretty sure you wouldn’t believe me, and given that Parable of the Talents is a sequel to Parable of the Sower, you’ll probably need a little more convincing if I’m suggesting that you read two books. Plus, y’all know I’m not likely to just make a suggestion and leave it at that. I like to pick apart my own opinions too much not to dig into why I liked this so much. 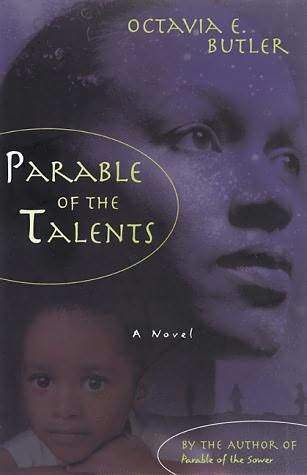 In Parable of the Sower, Butler told the story of Lauren Oya Olamina, a young woman who, in the midst of violent civil unrest in the year 2024, escaped her California home and walked north, gathering around her a community of friends and followers. As they walked together, Lauren sowed the seeds of a new religion that she called Earthseed. In Parable of the Talents, we learn what happened to the believers in Earthseed after they settled down and built a small community called Acorn. The book is made up of writings from Lauren’s journal, as selected by her daughter many years later. Also included are brief excerpts of books by Lauren’s husband and her brother. Lauren’s daughter, who clearly has mixed feelings about her mother’s legacy, offers her own reflections on Lauren’s life and on Earthseed, her first and most beloved child. Despite the dangers everyone faced in Butler’s version of the early 21st century, Lauren’s small Acorn community thrived in its early years. They’d planted fertile gardens, started a school, acquired a truck, and were making connections with neighbors. Earthseed rituals were being developed and passed along within the community. The world outside was in chaos, and the people of Acorn were always on alert, but they had an idyllic life. That is, until the election of President Donner of the Christian America party. A group calling themselves Donner’s Crusaders decided that the way to get the U.S. back on track was to round up those deemed a danger and reeducate them. Acorn, with its unconventional beliefs, was an obvious target. I mentioned above that I thought this was a better book than The Handmaid’s Tale, and it’s largely because I found Butler’s vision of an America under the leadership of an extreme right-wing Christian group to be far more convincing than Atwood’s. As much as I love Atwood’s book, I could never see the practices regarding women that are a way of life in her Gilead becoming the norm. Rampant sexism and subjugation of women, yes, but the sexual practices would, I think, be confined to smaller communities–whispered about in closets and basements, glossed over perhaps with an exchange of money to give the appearance of a sort of legitimate surrogacy that skipped the artificial insemination step. There are plenty of people who would think the Church was doing something generous and necessary—teaching deadbeats to work and be good Christians. No one would see a problem until the camps were a lot bigger and the people in them weren’t just drifters and squatters. As far as we of Earthseed are concerned, that’s already happened, but who are we? Just weird cultists who practice strange rites, so no doubt there are nice, ordinary people who would be glad to see us taught to behave ourselves too. How many people, I wonder, can be penned up and tormented—reeducated—before it begins to matter to the majority of Americans? Do they know? Would they care? There are worse things happening here in the States and elsewhere, I know. There’s war, for instance. This book was published in 1998. Before Guantanamo. Before the War on Terror. Aside from the prescient social commentary, I was intrigued by the way Butler handles religion. Like Atwood in The Handmaid’s Tale, she’s careful to show that Christianity as a whole is not necessarily the problem. There are Christian characters who are not part of the government, and some who are remain blind to the problem—in some cases, willfully blind. Butler’s story, however, shows a deep ambivalence toward religion in general, as evidenced in Lauren’s daughter’s commentary on her mother’s journals. In Butler’s America, religion, especially Earthseed, can be a great force for good. Earthseed is what motivates Lauren to continually strive against her oppressors and to seek people to nurture and love. She wishes to be like the good servant in the biblical parable, who takes the talents he’s been given and uses them to gain more. But her daughter wonders whether her mother’s commitment to the cause kept them apart. If Lauren had converted to the faith of Christian America, she might have had a chance at a relationship with her daughter, but she did not. And if Lauren’s uncle had been less committed to Christian America, he might have built a bridge between mother and daughter, but he did not. The cause became greater than anything, even family love. The third servant in the biblical parable hid his talents in the ground, fearing that he would lose them, only to be condemned in the end. But for Lauren, spreading the talents brought condemnation from a different quarter. Was it worth it? This is the fourth of Butler’s books that I’ve read and by far my favorite. I’m not sure that it’s her best. Some might find it preachy in a way that her other books aren’t, particularly when it comes to the subjugation of Acorn. I found the exploration of the effects of enslavement and torture on the enslaved and tortured to have value, however. And Butler’s handling of religion is challenging in the best of ways. But what grabbed me by the throat was the book’s relevance to today’s political scene. All my fears about the political climate came to fruition in this book. Yet I was left hopeful. The U.S. political system is easily manipulated, but there are correctives built into it. We the people are the corrective, and if we strive to be the best versions of ourselves, we have the power to change things. 2024’s not all that far off! I’ve been meaning to read Octavia Butler for a long time. Thanks for sharing your thoughts on these. It is reassuring to note that some of the events leading up to what happens in these books would have happened by now to end up in that state by 2024. There are always so many books to get to first. Butler is one of the authors who was mentioned when I asked for suggestions for science fiction reads and from what you’ve said here I think this is where I’m going to start. One of my reading groups would love this I’m sure, so the first of the two books is going to be my next pick. Thanks. I think these books are pretty easy to like if you’re into more dystopian science fiction, not too heavy on the science. Isn’t it a great book? I think I read somewhere she had planned three books in this series. I am so sad that number three will never happen. I read the same thing–The Parable of the Trickster was the title (interesting that it’s not a biblical parable). It is sad she didn’t get to finish. I’d love to know what she had in mind. But at least this felt complete as it is, so we’re not left hanging. Better than The Handmaid’s Tale……well……..I’ll agree to just as good. While I liked Sower better, I prefer journey stories to be honest, and I think Kindred is still my favorite, I loved this book. One thing I admire most about Octavia Butler is that she never shys away from big topics. She has the characters we need to keep us reading, there is plenty of personal in her work, but she’s always about very grand ideas at heart. Am I right that Acorn’s eventual, utlimate triumph lies in creating a ‘religious’ belief in a future of space travel? That’s a darn big idea. I would have loved to read book three, too. I figured someone would want to argue with me about that. It has been a long time since I read Handmaid’s, so my main comparison has to do with how convincing I found it. I agree about the big ideas. I also like that she lets those big ideas stay messy and complicated. Her books don’t feel preachy to me. You’re right about the space travel being an ultimate goal of her religion, although it’s more that she sees space travel as a way to spread her beliefs, rather than the belief itself. What’s interesting/messy about it is that it’s mostly Lauren’s hope, and it galvanizes her into action. It’s never clear how on board her followers are. Lots of big ideas there about the nature of belief and its effect on our behaviors. . I remember this author’s name coming up when I read Laurie King’s Califia’s Daughters, and I meant to look for her then. Thanks for the reminder! I really need to read Califia’s Daughters, so thank you for that reminder! “The Handmaid’s Tale” is coming up on my mountain of TBR books. These seem like a good follow-up. I have a copy of this, and have never read any Butler. Sold! Is it necessary to read ‘Sower’ first, would you say? It would definitely help to read Sower first. You could follow the story in this book well enough without it, but Sower provides important background. It has been quite awhile since I read both Sower and Talents but you have me wanting to revisit both of them. They do seem like books that would be worth revisiting.